Keyword research is the starting point for any SEO strategy. If you don’t get it right you will never be successful with SEO. In this article, we will learn a step by step process to do keyword research for your Shopify store. The first step of the keyword research process is to create a worksheet. It’s very important to list and organize your keywords. You need to research keywords separately for your collections, products and the home page. Unless you are selling a very few products, the collection pages are most potential for SEO. Let’s see how to research keywords for a collection page. For product pages or the home page, the approach will be same. To find the keywords for your collection/products you need to understand what exact phrases are being searched by online users. Say you are selling handmade clothing and accessories for women. You may want to create a separate collection for handmade shoes. You should start your research on Google search. Now you need to get into a consumer’s shoe to guess what a consumer may search. A methodical approach is to start with a search term which contains the generic keyword as well as the special keyword which narrows down the competition. Go to the Google search and start typing the keyword “handcrafted women shoes”. Once you type few words you will start getting suggestions from Google: Google gives the suggestion based on the actual search terms people are using to search on Google. Now select the search term which closely represents your collection. Here, if you are selling only leather boots then you should select “handcrafted women’s leather boots” but if you are selling various kinds of shoes, you may also like to pick “handcrafted women’s shoes”. Once you select the search term you will get the search results. If you scroll down to the end of the page you will see a list of related search terms. 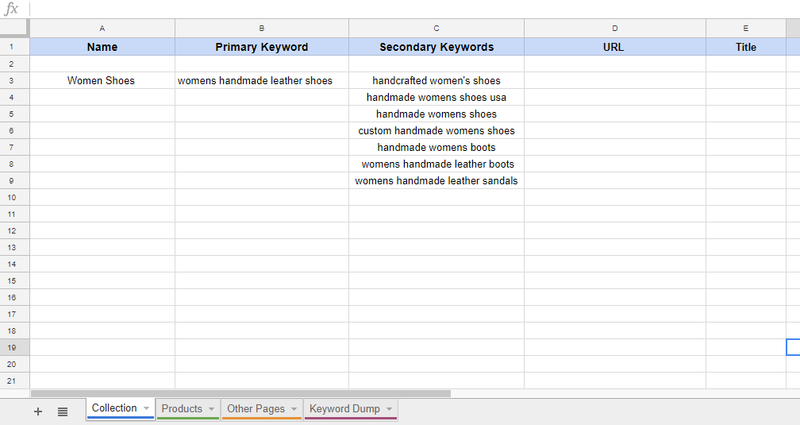 Now, before moving to the next step, copy the current search term “handcrafted women’s shoes” in the Keywords column of the **Keyword Dump **tab of the sheet. Now find the pick the appropriate search terms from the related searches. Here, the following search terms may fit for your collection. Add all these search terms in your Keyword list. Now if you click on any of these search terms you will find more search terms in the related searches section. Again pick the one which is appropriate for your collection and search terms. Keywordtools.io is a very useful tool for keyword research. It actually lists all the related keywords for any keyword by scraping Google’s autocomplete suggestions. Now search with the basic keyword you have found from Google. For this example, it’s “handmade women’s shoes”. You can also select the country and language for which you need the keywords. You will get a list of keywords closely related to the search term. For the free version, you will not get the search volume data for the keywords but that’s something you can get from Google Adwords keyword planner. Now see the keywords, most of the populated search terms have the keywords – handmade women’s shoes. So this can be assumed that these keywords “handmade women shoes” should be your focus. Step 3: Choose the primary keyword and separate the secondary keywords. Once you have gathered all the ideas of the possible keywords, it’s time to decide one primary keyword to target. You have already got the idea in the last step that “handmade women shoes” should be there. Now, it’s good to be more specific. If you are only selling leather shoes, you may consider “handmade women leather shoes” as the keyword. You may also like to verify it from Google. Try typing the term on Google search and you will get the autocomplete suggestions, from which you can pick the one which is appropriate. In this case, it’s “women’s handmade leather shoes” is the most appropriate search term to target and can be considered as the primary keyword. You need to put it in the Primary Keyword column of the respective tab in the sheet. As we are researching keyword for a collection, we will put in the Collection tab of the sheet. Now take all other keywords in your list and put them in the Secondary keywords column. Use the keywords profoundly in the URL, Title and the Meta Description for the page. Now here’s a complete guide for how to craft perfect title and meta description for your Shopify store.